不可算名詞 水; 飲料水 《★【解説】 英語の water は「湯」も含み，日本語の「水」と違い「冷たい (cold)」とは限らない》. a glass [bottle] of water コップ 1 杯[ひと瓶]の水. fresh [sweet] water 淡水, 清水. Water is turned into steam by heat. 水は熱で蒸気に変わる. turn on [off] the water (コックをひねって)水を出す[止める]. drink [take] the waters 〈湯治客が〉鉱泉水を飲む. 不可算名詞 [また 可算名詞] (鉱物質を含む)飲料水; 炭酸水. 不可算名詞 [しばしば the water] (空中・陸地に対する場所としての)水中. Fish live in water. 魚は水中にすむ. jump into the water 水中に飛び込む. 不可算名詞 [しばしば the waters; 通例修飾語を伴って] (海・川・滝・湖・池などの)流水; 海水，河水. the waters of the Nile ナイル川の水. Still waters run deep. ⇒still１ 形容詞 2b. in waters under the direct control of… …の専管水域で. above [below] (the) water 水面上[下]で. ⇒high water 1, low water 1. 不可算名詞 [種類には 可算名詞] 溶液; …水，化粧水. an expensive toilet water 高価な化粧水. water on the brain [knee] (病気による)脳[ひざにたまった]水.
a diamond of the first water 最高級のダイヤ. a scientist of the first water 一流の科学者. a fraud of the first water とびきりの詐欺(さぎ)師.
water bugs 水生昆虫 《特に, マツモムシ, ミズムシ》; 《主に米国で用いられる》 ゴキブリ. water a lawn [the streets] 芝生[街路]に水をまく. Please water the plants. 草木に水をやりなさい. water the cattle at a stream 小川で牛に水を飲ませる. This area is well watered by rivers and brooks. この地域はたくさんの川や小川があり水が豊富だ. This milk [wine] seems to have been watered (down). この牛乳[ワイン]は水で薄めてあるようだ. Smoke makes one's eyes water. 煙が目にしみると涙が出る. His mouth watered at the sight of the food. 彼はその食べ物を見てよだれを流した. The smell made my mouth water. 私はそのにおいをかいでよだれが出てきた. We use too much water; we should conserve it. Sprinkle water over the lawn. Wash it in lukewarm water. Running water is supplied to all the cottages. Run water into the tub. They cut off her water when her bills were overdue. The child couldn't hold his water any more. He had water on his knee. He threw a stone in the water. It is about 6 feet of water here. They put a mark on the wall to show the high water of the flood. He keeps a record of the river's high and low water . The waters of the river pass through many states. He traveled the waters of the South Pacific. Fishing was banned from the coastal waters. We are now in Indian waters. The ship invaded Chinese waters . We are not allowed to wash cars because of the water shortage. They serve drinks as weak as water at the pub. Our business is now in smooth water. We can ship this timber by water. When you are miles from shore you are in deep water. Your plan doesn't hold water. She spent her money like water. It is a diamond of the first water. The new ship took the water. They went to Saratoga to take the waters. Test the waters before putting it on the market. The bridge is under water. Forget about our former talk, it's all water under the bridge. His name was written in water. Don't forget to water my flowers. Water the dogs while I'm away. Much farm land is watered by the same river. You didn't water this wine, did you? The birds water at the pond. The ship waters at Honolulu. The odor was so bad my eyes watered. The pie made my mouth water. They watered down the TV version of the movie. From Middle English water, from 古期英語 wæter (“water”), from Proto-Germanic *watōr (“water”), from Proto-Indo-European *wódr̥ (“water”). Cognate with Scots wattir, watir (“water”), North Frisian weeter (“water”), Saterland Frisian Woater (“water”), West Frisian wetter (“water”), Dutch water (“water”), Low German Water (“water”), German Wasser, Norwegian Bokmål vann (“water”), Swedish vatten (“water”), Norwegian Nynorsk and Icelandic vatn (“water”), Old Irish coin fodorne (“otters”, literally “water-dogs”), Latin unda (“wave”), Lithuanian vanduõ (“water”), Russian вода́ (vodá, “water”), Albanian ujë (“water”), Ancient Greek ὕδωρ (húdōr, “water”), Armenian գետ (get, “river”), Sanskrit उदन् (udán, “wave, water”), Hittite 𒉿𒀀𒋻 (wa-a-tar). (uncountable) A substance (of molecular formula H₂O) found at room temperature and pressure as a clear liquid; it is present naturally as rain, and found in rivers, lakes and seas; its solid form is ice and its gaseous form is steam. (uncountable, in particular) The liquid form of this substance: liquid H₂O. For more examples of usage of this term, see Citations:water. 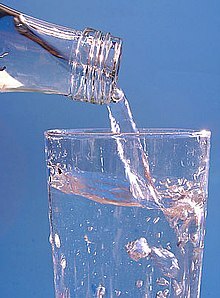 (countable) A serving of liquid water. (alchemy, philosophy) The aforementioned liquid, considered one of the Classical elements or basic elements of alchemy. (uncountable or in the plural) Water in a body; an area of open water. The president expressed hope that creating rain over waters between the countries would help reduce pollution. The boat was found within the territorial waters. These seals are a common sight in the coastal waters of Chile. (poetic, archaic or dialectal) A body of water, almost always a river. But ere he came to Clyde's water, fu' loud the wind did blaw. On one side lay the Ocean, and on one / Lay a great water, and the moon was full. A combination of water and other substance(s). (countable, often in the plural) Spa water. (pharmacy) A solution in water of a gaseous or readily volatile substance. Ser Dunaver's squire Jodge could not hold his water when he slept. (figuratively, in the plural or in the singular) A state of affairs; conditions; usually with an adjective indicating an adverse condition. the outstanding stock and bond obligations of the company were reduced from $34,000,000 to $24,000,000 by squeezing out the water. The limpidity and lustre of a precious stone, especially a diamond. A wavy, lustrous pattern or decoration such as is imparted to linen, silk, metals, etc. (transitive) To wet or supply with water; to moisten; to overflow with water; to irrigate. Men whose lives glided on like rivers that water the woodlands. (transitive) To provide (animals) with water for drinking. (intransitive) To get or take in water. The ship put into port to water. (transitive, colloquial) To urinate onto. Nature called, so I stepped into the woods and watered a tree. (transitive) To wet and calender, as cloth, so as to impart to it a lustrous appearance in wavy lines; to diversify with wavelike lines. water in The Century Dictionary, New York, N.Y.: The Century Co., 1911.
water in Webster’s Revised Unabridged Dictionary, G. & C. Merriam, 1913.